Shute Barton is one of the most important non-fortified medieval manor houses in England. Entered via an imposing gatehouse, the earliest part of the property dates back to 1380. The Grey family, owners throughout the 15th and early 16th centuries, made considerable alterations and were busily extending their property when, in 1554, they embarked upon their ill-fated attempt to place Lady Jane Grey onto the throne of England and, as a consequence, fell from fabour. Their properties were forfeit and the house was leased to the de la Pole family, who later purchased it outright. 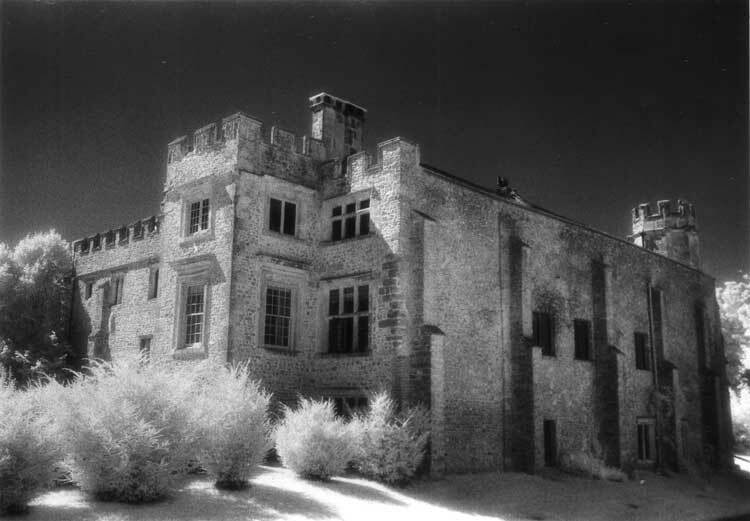 It is still the home of their descendents, the Pole-Carew’s although it is actually run by the National Trust. The house possesses a relaxed ambience, and although great changes have been made to the property, its ancient origins are still clearly visible, most notably in the Solar where two garderobes and exposed roof timbers can be seen. The house’s entrance hall boasts the largest fireplace in England, which at 22-feet wide takes up the entire end wall of the room. With such an impressive pedigree it would come as a great surprise if Shute Barton Manor House wasn’t haunted. Fortunately at least one former resident has chosen to remain behind as a grey lady. Others, however, maintain that she was a member of the de la Pole family who is thought to have lived at the property during the Civil War. The de la Pole’s were staunch Royalists, and one day legend holds that a group of Parliamentarians ambushed this unfortunate lady as she walked through a grove near to the house. Placing a rope around her neck, they threw it over the branch of a tree and hanged her. A group of nearby trees is still known as ‘Lady’s Walk’ in commemoration of the long ago act of infamy and her revenant is said to put in regular appearances around the place where her days ended so violently. Witnesses have described her as having a determined face, and an air of familiarity about her. Indeed several have mentioned that she walks about "as if she owns the place" - which, at one time, she might well of done. She doesn’t take kindly to being approached and should any who se her attempt to do so she will fix them with a admonishing stare and moment later vanish into thin air.